Show the dancer (or soon-to-be dancer) in your life that you care with the gift of dance lessons. Choose one of our packages and buy online now or contact our dance studio at 201-969-6260 to work out a custom gift that best fits their needs. Check out dancing or get a leg up with this introductory dance package which features 1 Private Lesson and 2 Group Classes. 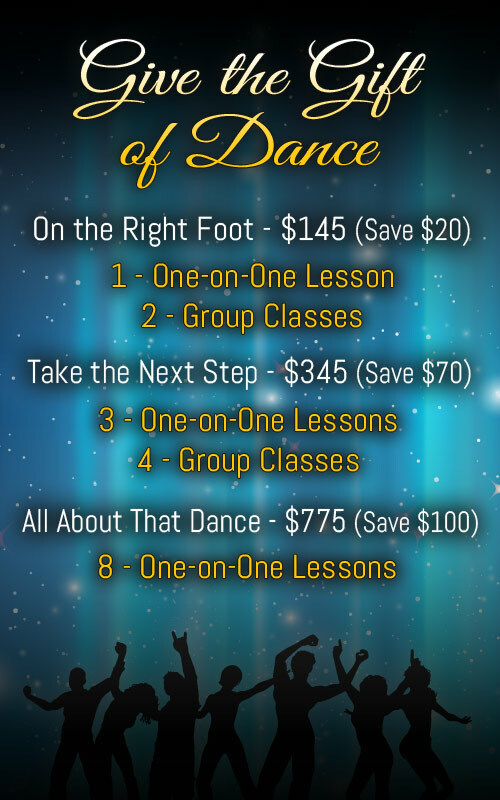 Jump in with both feet and build your dance foundation with this package which includes 3 Private Lessons and 2 Group Classes. Featuring 8 Private Lessons, this package is perfect for those looking to make dancing a hobby or have a special goal in mind. If you would like to purchase a gift certificate for a specific amount, please visit our online gift certificates retail page. Call us at 201-969-6260 or email us at info@jerseycityballroom.com with any questions about our gift certificates, types of dances we offer, or general questions about our studio community. We look forward to helping your loved one put their best foot forward!